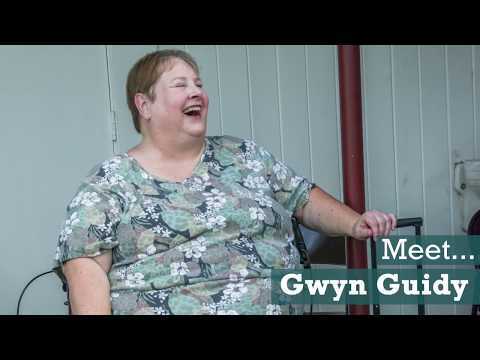 For a long time, Gwyn Guidy believed as her parents did: One person can’t make a difference. Fortunately, Guidy’s mindset slowly began to change on December 24, 1998. It was Christmas Eve when her mother died of cancer. And although it was devastating, the support she received from her mother’s caregivers was an awakening. Previously an agnostic, Guidy started going to church, where she was welcomed with open arms. Her journey from agnostic to Christian and cynic to activist had begun. Another key moment was when Jenifer Wagley, Deputy Director of Avenue, strode into the quarterly meeting of the community civic club to talk about the nonprofit’s Great Opportunities (GO) Neighborhood program and reinvigorated Guidy and her fellow board members. Among the many projects that followed were new parks, an improved football field, a new neighborhood school and an annual festival. The Sabor Del Northside (Flavor of Northside in Spanish) festival was dreamed up during her first trip to the NeighborWorks America Community Leadership Institute. More than half of neighborhood residents are Latinos, and her goal is to help them feel welcome, celebrated and safe. But there were three projects closest to Guidy’s heart: protecting the character and affordability of the community, obtaining a playground for her area and re-establishing the Near Northside “Super Neighborhood” (a designation by the city of Houston to allow specific communities to have a voice in their local government). In her role on the leadership council for the Super Neighborhood, Guidy helped convert two local churches into shelters for residents displaced by Hurricane Harvey. Guidy’s skills were shaped in large part by an earlier effort to ward off the potential ill effects of gentrification. When a city ordinance was adopted that allowed restrictions on minimum lot sizes for an entire area—not just block by block—she sprang into action. Guidy and her team secured the necessary resident signatures and over a period of two years, they successfully protected the residents of five separate areas from being pushed out by high-rise luxury apartments, including all 1,200 homes in the neighborhood. “One of the things I learned from the Avenue GO Neighborhoods program is to engage your politicians; make sure they know you and what you’re interested in. We did that, and got in on the ‘ground floor’ after the ordinance was passed. We got to sort of shape it!” she says. Meanwhile, however, there was still no playground for the kids in Lindale Park, where Guidy lives—something she had “dreamed of for seven years” while helping get parks and playgrounds in other areas. In 2015, she joined with her church’s vicar to obtain a KaBoom! grant and bring almost 200 volunteers together to build the neighborhood’s only playground. Yet, during all this hard work, Guidy was struggling with her own, personal challenge: In 2008, she was diagnosed with rheumatoid arthritis, and then in 2012 developed a life-threatening infection as a side-effect of one of her medications. She spent six weeks in the hospital, forcing her to step down from the Avenue board of directors.